Home » EA is Doubling Down on Star Wars: Battlefront II! EA doubled down on the beleaguered Star Wars: Battlefront II today during their EA Play live event. Battlefront was released last year amidst controversy over its aggressive loot box system. It fell short of sales projections, angered fans, and (worse) reportedly brought the wrath of Disney themselves down upon them. They could have left Battlefront hanging and dedicated resources elsewhere, but they appear to be dedicated to writing the ship. They specifically mentioned the rough start that the game had during their portion of the event! They announced additional content for their game, but not before issuing a long apology in response to the backlash over the highly publicised “loot box” controversy. They didn’t directly apologize, but they acknowledged player feedback and confirmed their commitment to fixing their monetization system. 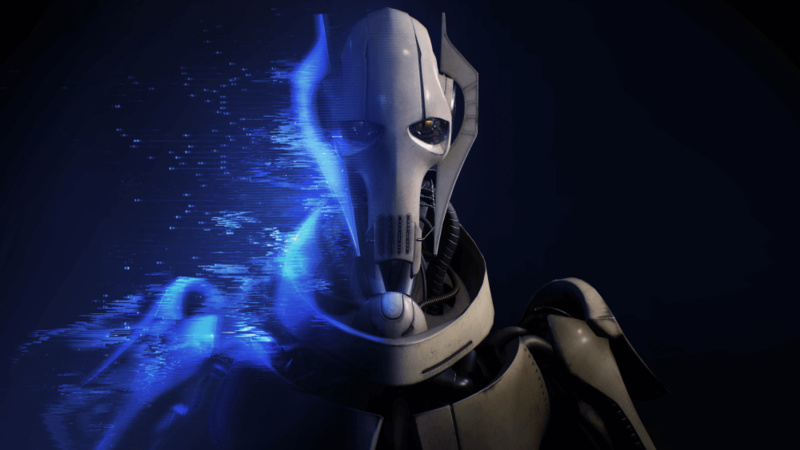 They are making significant additions to the game over the remainder of the year include a new Season of content built around Solo and the addition of characters from the Clone Wars era. Solo may not have been the box office success that Disney wanted it to be, but it is still a Star Wars movie. That all but requires an season of content for Star Wars Battlefront II. A new update will go live on June 12th that will include that season’s content. They also announced future content that features planets and heroes from the Clone Wars era. The Clone Wars took place between the Attack of The Clones and Revenge of the Sith movies. The heroes and villains include General Grievous, the leader of the droid army, Commander Obi Wan Kenobi, and Anakin Skywalker (before his turn to the dark side of the Force). They teased maps and game content on planet Geonosis, but they didn’t give any hard details. Both EA and DICE have a long way to go redeem themselves in the eyes of the gamer public. EA has had a history of using microtransactions in many of its popular games, as well as what feels like shoe-horning them into titles where none would really be appropriate. What made Star Wars Battlefront’s microtransactions so grating is that player progression was otherwise limited by requiring long hours of gameplay, and even then its microtransactions were randomized, encouraging large quantity purchases in order to get the character that the player was set on acquiring. This lessons learned from Battlefront 2 have the gamer community in a wiser place. It does appear though that EA has cut or dramatically reduced microtransactions in many of its future titles in other series, but only time will tell if EA keeps to what was learned the hard way with its future games.